Just scored my first Sunrise label. Or rather, I should say, Mom got it at an estate sale that I had tipped her off about located on the outskirts of Wilmington, NC. [RCA Victor's first foray into the budget market was the 35c Timely Tunes. Sold through Montgomery Ward stores, 40 issues appeared from April to July, 1931. In July, 1932, appeared the first, short-lived Bluebird record, along with an identically numbered Electradisk record sold at Woolworth's. These 8" discs, probably an early form of test marketing, may have sold for as little as 10c. Bluebirds bore a black-on-medium blue label; Electradisks a blue-on-orange label. 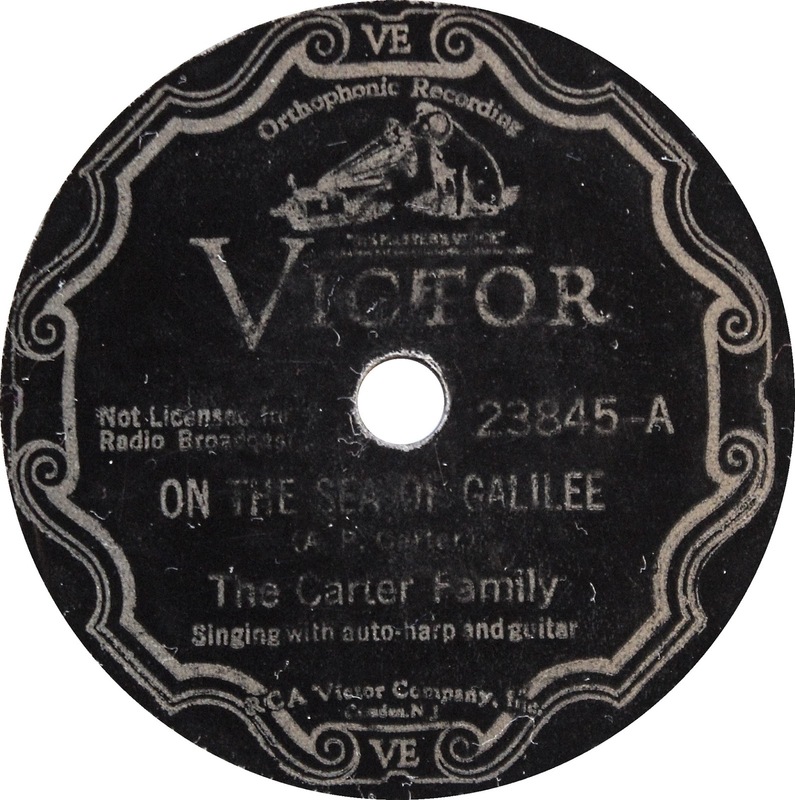 Credit for establishing the label is given to Victor's executive Eli Oberstein, who had previously set up the distribution deal to press the independent Crown label. The 8" series only ran from 1800 to 1809, but both labels reappeared later in 1932 as 10" discs: Bluebird 1820–1853, continuing to April 1933, and Electradisk 2500–2509 and 1900–2177, continuing to January 1934. Electradisks in the 2500 block were dance band sides recorded on two days in June, 1932. These very rare issues were given Victor matrix numbers but the 4 digit matrix numbers on the 78 look more like Crown Records (this independent label had its own studios, but its product was pressed by Victor). The few records in that block that have been seen, resemble Crowns; leading to speculation that all were recorded at Crown. 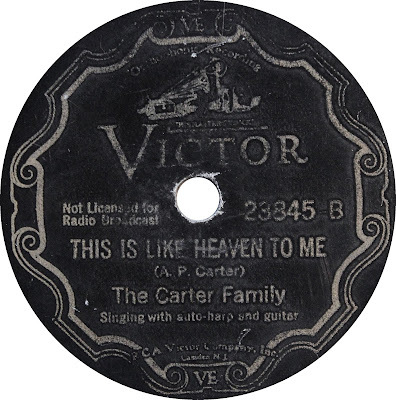 In May, 1933, RCA Victor restarted Bluebird as a 35c (3 for $1) general-interest budget record, numbered B-5000 and up, with a new blue-on-beige label (often referred as the "Buff" Bluebird, used until 1937 in the US and 1939 in Canada). Most 1800-series material was immediately reissued on the Buff label; afterwards it ran concurrently with the Electradisk series (made for Woolworth's). 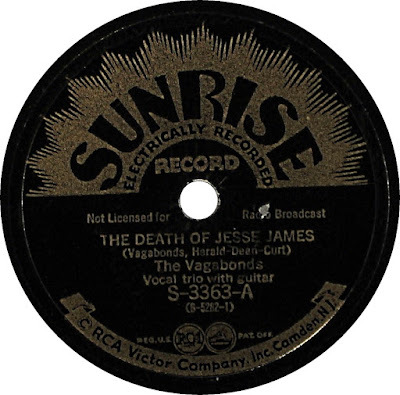 [The Vagabonds were an early star act on WSM's Grand Ole Opry in the 1930s. The act was a bit different in that they had a "Traveling Unit". They wrote that it was organized so that radio audience could see in person the outstanding acts of the Opry. They said their show was a "theatrical production" and not just an amateur routine of radio talent. Much time and money was said to have been spent so that the audience could see the "true personality" of each of the performers. Each performer in this show was said to be a true native of the hills of Tennessee and not a synthetic product which you so often saw in theatres in the larger cities in this country. The Vagabonds' Traveling Show appeared in some of the best theatres in the country and was said to always have attracted large crowds. Dean Upson v / Curt Poulton g, v / Herald Goodman v.
Recorded in Chicago on April 26 (Ninety-Nine Years) & July 27 (Jesse James), 1933. Will Weldon, Vol Stevens v, g.
Recorded in Atlanta on October 20, 1927.